The Chillon viaduct is located in Switzerland, over the east end of Lake Geneva, south-east of Montreux. 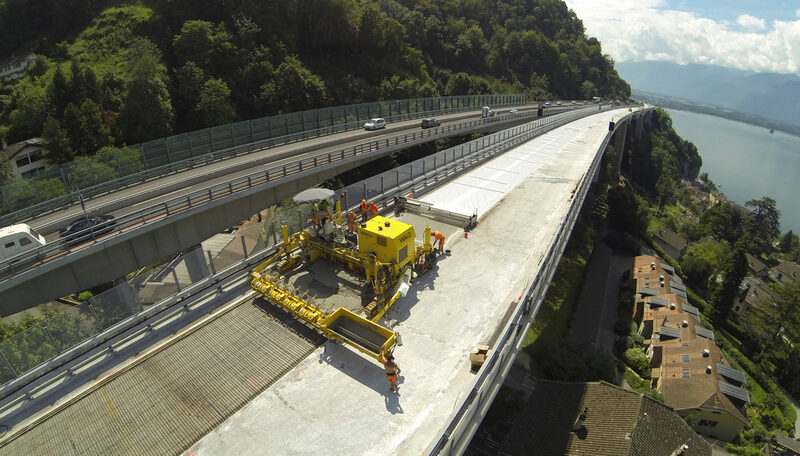 It comprises two parallel 1.4 mile long prestressed concrete box girder bridges, bearing the east and westbound lanes of the Swiss A9 highway. Built in the 1960s, it was one of the most significant works in prestressed concrete for many years, so it was of great historical value to the area. Originally designed to sustain an estimated volume of 10,000 vehicles per day, it is currently being used by 60,000 vehicles daily. The bridge was scheduled for deck rehabilitation, but an inspection of the viaducts revealed that they were significantly damaged and deemed structurally deficient. In various places, the concrete’s reinforcing bars had been corroded and the concrete itself was betraying signs of Alkali-Silica Reaction (ASR). On closer inspection, following hydrodemolition tests, Alkali-Aggregate Reactions (AAR) were also detected, which meant the mechanical properties of the concrete were compromised. If repairs were not undertaken, it is likely the structure would have needed complete rebuilding. 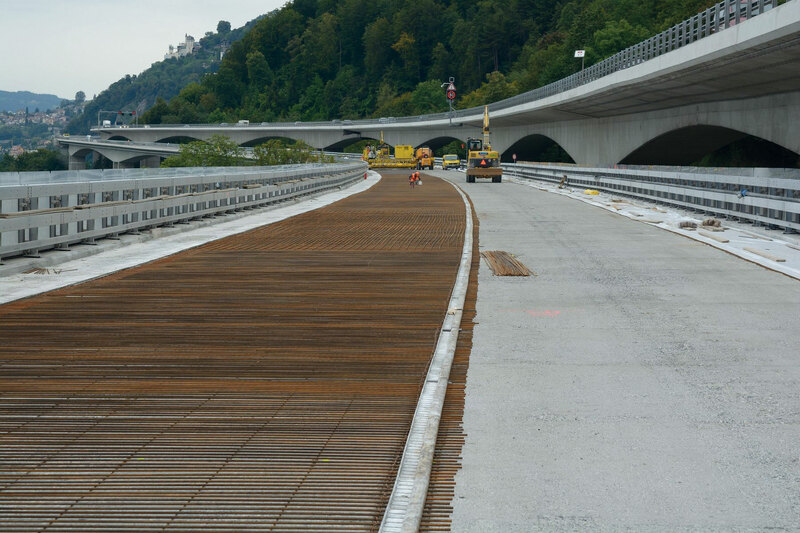 With an ever-increasing number of vehicles using the bridge, a solution was required to increase the shear, bending and fatigue resistance of the deck slab. The structure also needed any damage caused by ASR and AAR to be reversed, as well as waterproofing to prevent future damage and a significant improvement of its structural properties. 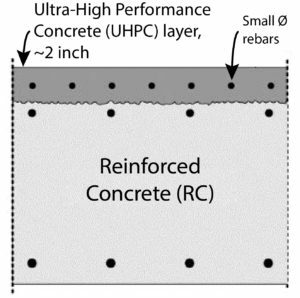 A thin steel rebar-reinforced Ultra-High Performance Fiber Reinforced Cement-based Composite (UHPFRC or UHPC) overlay was selected as the best and most cost-effective solution to meet the complex needs of the structure. 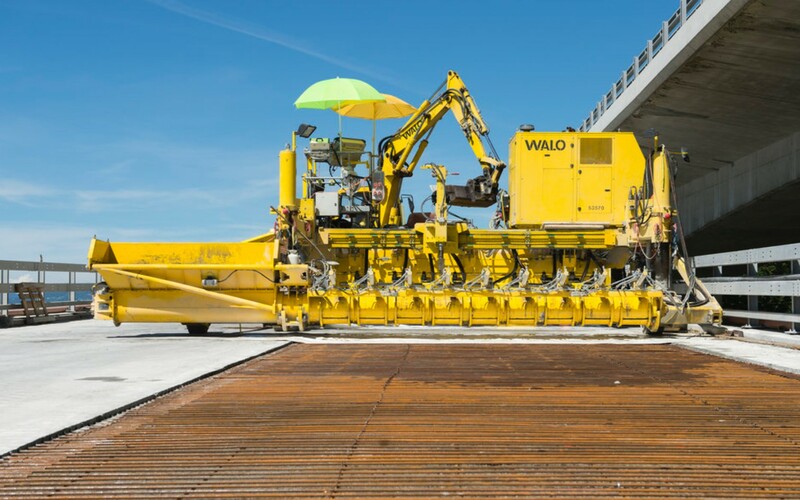 The material has extraordinary strengthening and waterproofing qualities and, with the right skills and machinery, it is possible to place it extremely quickly, meaning that the carriageway could be closed for the least amount of time possible, minimizing disruption and costs. Contact us to know more about the engineering possibilities using UHPC our engineering-team will be there to answer your questions.